Today dawns as a gorgeous clear blue day - we have choices in what we are going to do. We decide to do the walk rather than cycle, as my flu is still niggling, from our village to the neighbouring one of Kintzheim along the cycleway which avoids the main roads. This is only a short distance through this cutting, maybe a couple of kms and it runs through vineyards and horse paddocks. You can see the ruins of an old chateau on the hill behind the vineyards and then even further up Haut Koningsbaurg castle. We will take a walk to the ruins when I'm feeling a little better. We came upon a couple of huge frisky female draft horses who were galloping around their paddock, running right up to the fence and darting back at the last moment, which was a bit frightening. But they were absolutely stunning and they seemed to be showing us how powerful they could be. When we had walked the loop around the town looking at all the traditional shops and houses, greeted the residents, we stopped off for lunch at the Caveau Brunstein, a restaurant and B&B, decorated with period paraphenalia. We had warmed goats cheese and salad which was light and fresh and I would recommend stopping off to sample some of their food. Today dawned rainy and grey, so we decided to jump in the car and visit some of the neighbouring villages. 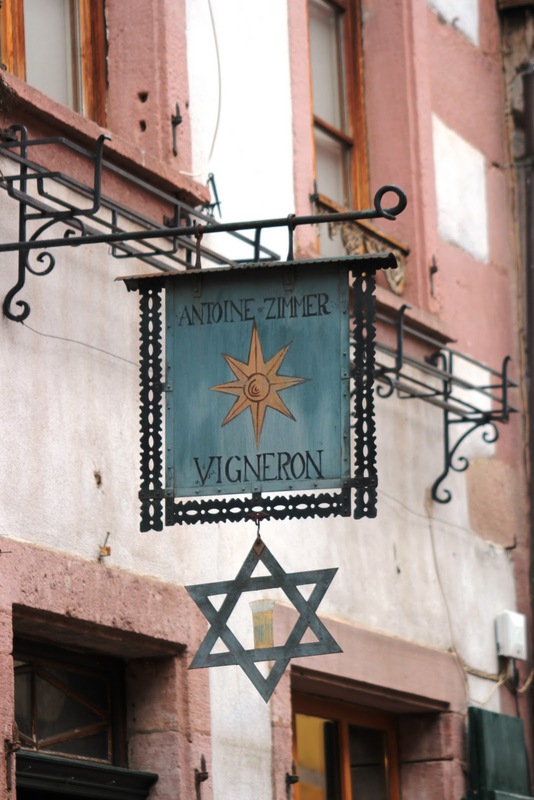 This was amazing - within about 20 km we visited 6 villages including Ribeauville, Bergheim, St Hippolyte and Riquewihr. We drove around Bergheim and vowed to return as it was so incredibly beautiful with views from the heights overlooking the vineyards and on to medieval villages in the distance. We parked the car in Riquewihr (known as the witches town) just inside the ancient town wall and strolled the brocante shops, tasted some great local wines and checked out the architecture - fantastic. The houses resemble rows of licorice allsorts in similar colours, with the quaint and intricate shop shingles displayed above the shop door to indicate the professions of the residents. The villages were very quiet which provided an opportunity to get an idea of where we would return to get a more in depth picture of the life in these gorgeous Alsation villages. On ﻿﻿﻿﻿ Tuesday we drove 3 hours south west from Chatenois to Beaune in Burgundy to ultimately undertake a cooking course with Marjorie Taylor of the Cook's Atelier that I had arranged some time ago. Steve came along to take photos and he was kindly invited to join in a most fabulous lunch that Marjorie and her daughter Kendall had arranged for us. I will do a separate page on the events of the day. I was unprepared for the beauty of this medieval fortified city, although we had been told about it and read up a little, but it is so beautiful. There is something so pure about the villages whose buildings are built of the light coloured stone as this is. Monsieur Hess' fromagerie - OMG! We had pre booked some accommodation, Barbary Lane Duplex, http://www.barbary-lane-houserental.com/eng/index.htm for 3 nights on spec and it turned out to be wonderful, so extended our stay by another 2 nights, because as it turned out there was so much to see and do. We spent this morning looking in some wonderful kitchen shops and viseted the Hotel-Dieu, the 15th century convent-turned hospital for the poor and now a museum. It's a perfectly preserved example of high gothic architechture, founded in 1443. The highly glazed ceramic roof tiles still glistening in all their glory. Yesterday we drove out to explore some vineyards and if we stumbled across any brocante.......well we might just call in to those too. The further north we drove from Beaune, the more prolific the vines were covering the rolling hills. The morning mist still hung off the tops off the hills giving a slight blur to the distance view that only increased the beauty﻿﻿ of the area. Steve had an idea of where we were heading and I controlled the GPS, who we've named Moira - which was hard work, she has a mind of her own. We called in to our first vineyard, and were sipping wine at 10.00am, with the strong taste of toothpaste still lingering in our mouths. ﻿﻿mmmmm! We gradually worked our way through, calling into another beautiful little town after another, stopped off and had lunch then ended up at the town of Gevrey Chambertin at Philippe Leclerc's cave. Philippe is a character and invited us down to his cellar, it was amazing, like a movie set with low wall lighting, stag heads on the walls and tunnels heading off in all directions. We sampled some of his lovely reds, purchased some and called in at the cafe down the street. This was a classic, buzzy little cafe , with local vineyard workers getting down to the serious and noisy nature of eating and drinking lunch. Two sisters run the cafe who constantly shouted mock insults at each other and one of them brought meals out wearing a huge fuzzy black afro style wig with sunglasses on - speaking french so I'm not sure what this was all about. But very entertaining. We finished our day with a tour of the Cassissium and then drinking heavily fortified and currant flavoured Cassis of every description. We had a great day, and decided to stay in last night so we would be ready to party on our last night at Cave Madeleine and be up early for the Saturday morning Beaune market. who is this at Haut-Barr? Back in Chatenois now for a few days and making some side trips to neigbouring towns. Yesterday we drove to the pretty town of Saverne and checked out the Rohan Chateau situated on the banks of the Marn-Rhine Canal that runs through the town centre. The chateau was orignally built in the 13th century and then rebuilt again by Salins de Montfort. Saverne was at the crossroads of the Roman road linking Strasbourg to Metz. The sky was incredibly blue yesterday and the panoramas were amazing when we drove up the mountain to the hill top chateau of Haut-Barr which was built in 1170 and restored in 1583. We took a Mirabelle and Pomme tart to enjoy at the peak while sitting and admiring the panorama of vineyards and medieval villages beneath us. Bernstein Castle is built on a granite rocky outcrop, on an altitude of 562 meters. It is first mentioned between 1163 and 1179 when Thietmar is Lord of Bernstein. The castle was taken in 1227 by the bishop of Strasbourg. It was inhabited until the 16th century, then abandoned. The castle is composed of a pentagonal keep, which protects the accommodation of the Lord, and of a square tower sheltering the vault. Beneath the castle is a bailey. There is an underground cistern in the southwestern corner of a second enclosure, built in the 15th century, next to the bailey. This site offers great views of the surrounding landscape. Last Thursday we made an excursion up to some more ruins situated behind Scherwiller, called Ramstein and Ortenbourg. We spent ﻿a few hours scrambling up to the top of the rocky outcrop where they were both perched. The sky was an incredible blue, which looked almost fake with the vista of the ruins superimposed against it. These ruins were accessible in part and we climbed where we could, marveling at the expansive sight across the plains towards Chatenois and Kintzheim. We tried to visualise the layout of the Ortenbourg fort, and you could see where the cellar; the kitchen and fireplace was. I still cannot conceive of the manpower it must have taken to haul each of the granite blocks to actually construct these buildings, and that they are still standing after centuries, exposed to the extreme weather conditions. After we had marveled enough we thought it time to make our way back down. Getting down was much easier, and lo and behold I jumped off a rock, misjudging its height, and my knee took the weight of my fall which did not survive too well, and limped back to the car. Now some might say that I have a "thing" for French hospitals, as an experience a few years ago landed me in one. ﻿ Well, as it happens there I was again, only it was my extremely wobbly knee that was the problem this time. The French hospital sytem, once again, jumped into gear and diagnosed my wobbly meniscus and had me secured in a brace, medicated, advised on what not to do and on our way within a couple of hours. On finding out qbout this, my daughters words were, OMG, catastrophic, accident prone, wrap in cotton wool, I knew it - so I thought I would post this to get it over and done with in one go! Diagnosis is 2 - 3 weeks with brace and then when swelling goes down, see how it goes. I can hobble around, and there is very little pain. I will see an orthopod when I get back to Australia to assess the damage. So here I am, being ministered to by my excellent nurse Etienne, and feeling pretty lucky to have not broken anything! 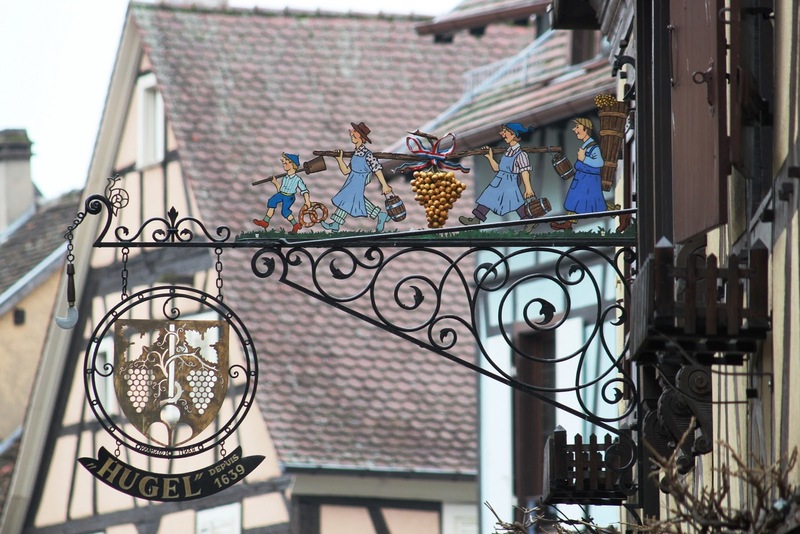 determined to continue the gastronomic adventures through research and somewhat reduced experimentation, but nevertheless still enjoying the ambience of Alsace. I have booked in for another cooking course on confiture in 2 weeks time and have 2 Michelin restaurants on my list to meet. Its giving me time to re-read Julia Child's books and am reading the Sweet Life in Paris by David Lebovitz. Already on day 3, the swelling is starting to go down, so it gets better from here!! Today it's raining and fairly gloomy in Chatenois, even so we head out to the local fruit and veg market to buy the ingredients to test out the traditional Alsation Baeckeoffe, a meat dish that is eaten at Easter. We go via the local brocante and ooh and aah through the window then head into our local boucherie to buy the ingredients for the dish and madame asks if we are cooking Baeckeoffe! we say yes, so she goes out the back and gets just the right cuts of pork; beef and lamb. She proceeds to give hints and tips on the cooking which was great although I only understood some of it! we are getting really good at reading hand gestures, but only the kind ones! We then decide to take another trip over to the picture book village of Riquewhir to seek out some cooking pots. The blossom trees are out and so are the spring bulbs - they are so pure and beautiful and the trees now have pretty, glistening carpets beneath from the fallen petals. The shops have magically transformed their windows into easter fairy tales. My knee is noticeably better, and the swelling has reduced so I can now negotiate sloping ground and stairs more easily although at a reduced pace. While there, I look enviously at the groups of elderly tourists with walking sticks, and for a split second, consider a smash and grab raid for one of their sticks, but the fast get- away might pose a problem. We wandered around and bought a pot and some Alsace rieslings, came back home and I marinated and photographed the ingredients for the Baeckeoffe while Steve played with his new toy, a whizz bang tripod. All is still well for Tin Tin and Co. in paradise! Have spent a number of days now resting the leg a little and making short trips from Chatenois. On Monday we went to the clothes market in Selestat, where markets have been held there since the 1400s, amazing. Bought some great bargains. We went to the Bliblioteque Humanist Library where some great examples of early literature as early as the 7th century and detailed calligraphy. We went to an amazing Brocante market at Scherwiller on Saturday, that was so huge we didn't make it around to look at everything, but snagged some lovely kitchenalia, just need to work out how to get it home. If one lived here, it would be easy to furnish the entire house from objet from the markets. Scherwiller is another gorgeous little town; fits our description of another beautiful town (ABT) and we intend to explore further when its not invaded by brocante hunters. We did, however explore Dambach de Ville yesterday, wow it was probably my favourite so far, chocolate box without the tourists. I have attempted making some traditional Alsatian fare, Baeckhoffe and Kugelhopf; which is in the oven at the moment. The Baeckhoffe was mouthwateringly good; not what I expected from the traditional meat and potatoes here, the marination overnight of the meat s in the riesling gave the dish a sensational piquancy that also made the meat just melt in the mouth. There is something wonderful about getting your hands in pastry and preparing the Kugelhopf was no exception. I loved making this, and have bought myself a very old ceramic Kugelhopf mould which has a dark patina of age on the outside and a beautiful used inside that smells like its had a lot of work, and I love it. I've just had to cover the top of the brioche in the oven to stop it from overbrowning. I will keep you updated on the result.